This Website Is No Longer Active. : The doctor who broke up families.Psychiatrist who damned hundreds as 'unfit parents' faces GMC probe. The doctor who broke up families.Psychiatrist who damned hundreds as 'unfit parents' faces GMC probe. A leading psychiatrist faces extraordinary claims he deliberately misdiagnosed parents with mental disorders – decisions which meant their children were taken away from them. Dr George Hibbert ( pictured above ) faces being struck off over his conclusions that hundreds had ‘personality disorders’ after assessing them at his private family centre. He was paid hundreds of thousands of pounds by social services for the reports which tore children from their parents – many of them young mothers. He is now being investigated over shocking suggestions he distorted the assessments to fit the view of social services. In one case, he is alleged to have wrongly diagnosed a ‘caring’ new mother – named only as Miss A – with bipolar disorder because her local authority wanted the baby adopted. After being confronted with this allegation, Dr Hibbert offered to surrender his licence to practise as a doctor rather than face a General Medical Council inquiry. But his request has been rejected by the GMC which says there are still ‘unresolved concerns regarding his fitness to practise’. He will now face a full fitness to practise hearing. Yesterday John Hemming MP, who has raised concerns about Dr Hibbert in Parliament, described the claims as shocking. The Lib Dem MP – alerted by a whistle-blower – said he had since spoken to ‘three or four’ other families who said the same had happened to them. He has written to Justice Secretary Ken Clarke demanding a full parliamentary inquiry. Mr Hemming said: ‘He is someone about whom a number of people have complained. I am told that at least one person has refused to work for him because of what she saw as his unethical provision of reports to suit the demands of local authorities. ‘Much of the decision making in care proceedings rests on reports from experts such as Dr Hibbert,’ he told Parliament. He added that supposedly independent experts such as Dr Hibbert, 59, were often little more than ‘the hired gun of the local authority’. The lack of transparency over such experts was leading to ‘thousands of miscarriages of justice in care proceedings’. Earlier this week, a study for the Family Justice Council revealed how life-changing decisions about the care of children are routinely being made on the basis of flawed evidence. A fifth of ‘experts’ who advise the family courts are unqualified. Dr Hibbert charged local authorities £6,000 a week for every family in his care and £210 an hour just to read documents such as medical records. By 2007 his company, Assessment in Care, was making a profit of around £460,000 a year from his lucrative arrangement with social services. He is now worth more than £2.7million. Last night a black Porsche Turbo, thought to be worth around £120,000, and a grey Porsche 911 Carrera, worth around £80,000, were parked on the gravel driveway outside his £500,000 country cottage. A former honorary lecturer at Oxford University, who has previously advised the government on care assessments, Dr Hibbert left the NHS to set up his private assessment centre in 2000. Since then, hundreds of parents in contact with social services – usually mothers and babies – have been referred to his centre to be assessed. 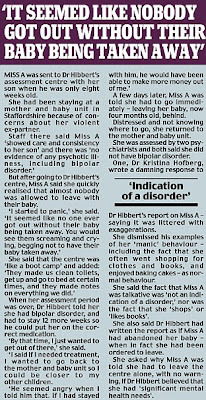 Concerns were first raised in 2007, when mother Miss A complained that Dr Hibbert had wrongly diagnosed her with a bipolar disorder. 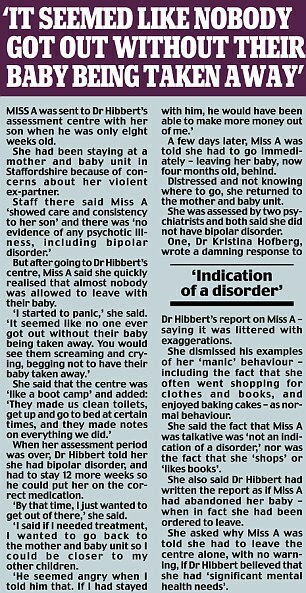 One consultant psychiatrist accused Dr Hibbert of having ‘no evidence’ for some of his claims and of deliberately ‘exaggerating’ and ‘misrepresenting’ aspects of the woman’s behavior. Her report is among a number of documents being examined by the GMC with regards to Dr Hibbert. He has not been available for comment at his two-storey detached cottage in the small village of Blunsdon near Swindon. His assessment centre next to his home appeared to be closed. 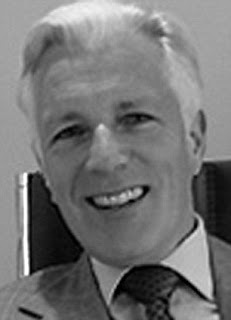 Paul Grant, of Bernard Chill Axtell Solicitors, who represents Miss A, said: ‘Our client has instructed us to launch proceedings against Dr Hibbert and the local authority. It iis not only psychiatrists/psychologists that are guilty of this kind of behaviour. A recent examination of a medical record used in Family Court proceedings and presumably will be used in further proceedings had glaringly obvious inconsistencies. The joint appointed, well qualified Expert Witness seemingly failed to notice these 'mistakes' .If and when this case comes before the GMC (a and I am veering towards WHEN) I will expect the GMC to behave in a similar professional manner. One can only admire a Man for breaking a Court injunction. I am fuming to think council's are wasting our hard earned money there should be a full investigation. The Council are using public money for fraudulent means. The council involved should be proscuted.